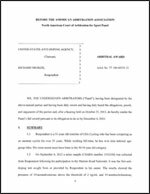 USADA announced today that a three-member, independent panel of the American Arbitration Association North American Court of Arbitration for Sport (AAA), rendered its decision in the case of Johan Bruyneel (Team Director), Dr. Pedro Celaya (Team Doctor) and Jose “Pepe” Martí (Team Trainer), finding that all three committed multiple anti-doping rule violations over many years. The Panel imposed a ten-year ban for Bruyneel, and eight-year bans for Celaya and Martí as the result of their roles in the USPS Cycling Team Doping Conspiracy. These three suspended individuals, together with the previously suspended Dr. Michele Ferrari, from Ferrara, Italy and Dr. Luis Garcia del Moral, of València, Spain (who each received lifetime suspensions), makes a total of five athlete support personnel from the USPS Pro Cycling Team to be suspended for anti-doping rule violations for their participation in the USPS Pro Cycling Team Doping Conspiracy. The Panel found that Bruyneel trafficked in performance-enhancing drugs and “was engaged in the allocation of team-related resources… causing a variety of prohibited doping substances and methods to be used expressly for the purpose of gaining an unfair advantage for the teams and cyclists he managed in cycling events.” In addition, the Panel found that Bruyneel himself “profited considerably from the successes of the teams and riders he managed during the relevant period.” Bruyneel encouraged athletes to use doping products including EPO, blood transfusions, testosterone, and cortisone. Bruyneel, who currently lives in London, is a former Belgian cyclist who, after a long career as a cyclist on pro teams, was USPS team director from1999- 2007(team name was changed to the Discovery Channel Cycling Team for the period 2005-2007 due to a change in sponsorship). During 2008-2009 Bruyneel was Director of the Astana Cycling Team. Beginning in 2010 he became the Team Director (or Team Manager) for the RadioShack Team where he continued to work until USADA’s case was initiated. Dr. Pedro Celaya is a Spanish doctor who worked in professional cycling as a Team Doctor for over a decade and currently lives in Elorrio, Spain. The Panel found that Dr. Celaya possessed and administered doping products, including EPO, blood transfusions, and cortisone. Celaya was a Team Doctor for the USPS/ Discovery Channel Pro Cycling Team from 1997 through 1998 and from 2004 through 2007. During all or part of the period from 1999 through 2003 Dr. Celaya was a Team Doctor for the ONCE cycling team. Dr. Celaya continued to work in cycling as a Team Doctor for the RadioShack Nissan Trek Cycling Team until USADA’s case was initiated. Jose “Pepe” Marti also was employed in professional cycling for over a decade and currently resides in València, Spain. The Panel found that Martí, a Team Trainer, trafficked performance enhancing drugs, including EPO, hGH, testosterone and cortisone to riders. Martí was involved in administering injections of EPO, testosterone, and hGH and in transfusing blood to riders. Martí worked with the USPS and Discovery Channel Cycling Teams during the period from 1999 through 2007 and thereafter worked with the Astana Cycling Team. Most recently, Martí worked with one or more riders on Team Saxo Bank-Tinkoff Bank team until after USADA’s case was initiated. Bruyneel, Celaya and Martí all chose to exercise their right to have their cases heard collectively by a panel of three independent arbitrators. Following a lengthy pre-hearing process including various motions filed by the respondents’ legal team, the four day evidentiary hearing took place in London, England in December of 2013. The hearing was held in London at the request of Bruyneel, Celaya and Martí for their convenience. Bruyneel, Celaya and Marti were collectively represented by seven lawyers at the hearing. At the hearing, extensive and detailed evidence was presented to the Panel, and testimony was received from 17 witnesses, 14 of which were principally fact witnesses, including 8 cyclists, and 3 of which were expert witnesses. All of the witnesses testified under oath, and were subject to cross examination. The Panel confirmed that, in accordance with the Code and the International Cycling Union Anti-Doping Rules (UCI ADR), USADA had authority to bring these cases, because USADA discovered the violations. Bruyneel’s sanction will end June 11, 2022 and Celaya and Martí’s sanctions will end on June 11, 2020.